As families gather later this week to celebrate Thanksgiving, let us all remember our veterans and active duty military and their families. On behalf of the people of Oregon’s 2nd District, I want to personally thank them for their service and sacrifice so that we can enjoy the fruits of liberty and freedom. For the first time since the base’s construction in 1928, the Secretary of the United States Air Force visited Kingsley Field earlier this month at my invitation. I invited Secretary Wilson to Klamath Falls to tour Kingsley Field, hear about the broad community support for the base and the troops stationed there, and meet with local veterans. Air Force Secretary Heather Wilson and I examine an F-15 fighter jet at Kingsley Field Air National Guard Base in Klamath Falls. During our tour of Kingsley Field, Secretary Wilson got a firsthand look at the expansive air space, state-of-the-art military infrastructure, and tireless work ethic of Kingsley’s leaders and the troops stationed at the base. Secretary Wilson also heard about the challenge of replacing aging aircraft at the base, and why Kingsley Field is uniquely positioned to become a future home of a next generation fighter jet, like the F-35. 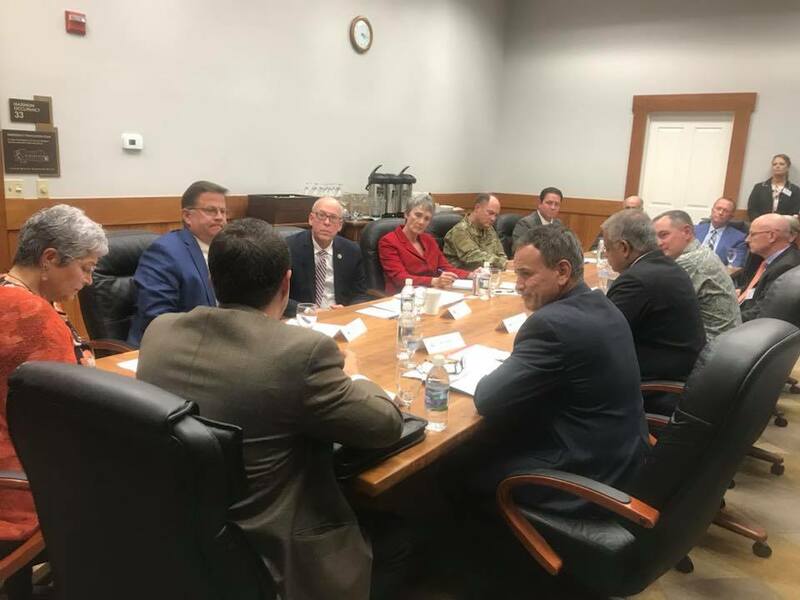 Following our tour of Kingsley Field, I convened a roundtable discussion with Secretary Wilson, local officials, and community leaders to discuss the broad support in the Klamath Basin for Kingsley. Kingsley plays a vital role in our national defense strategy, as well as job creation and the local economy in the Basin. Leaders in the higher education, medical, and business community in Klamath Falls told Secretary Wilson about the positive relationship they have with the base, and about how Kingsley Field is a true keystone in the community. The Secretary of the Air Force paid a visit this weekend to Kingsley Field Air National Guard Base for the first time in history. 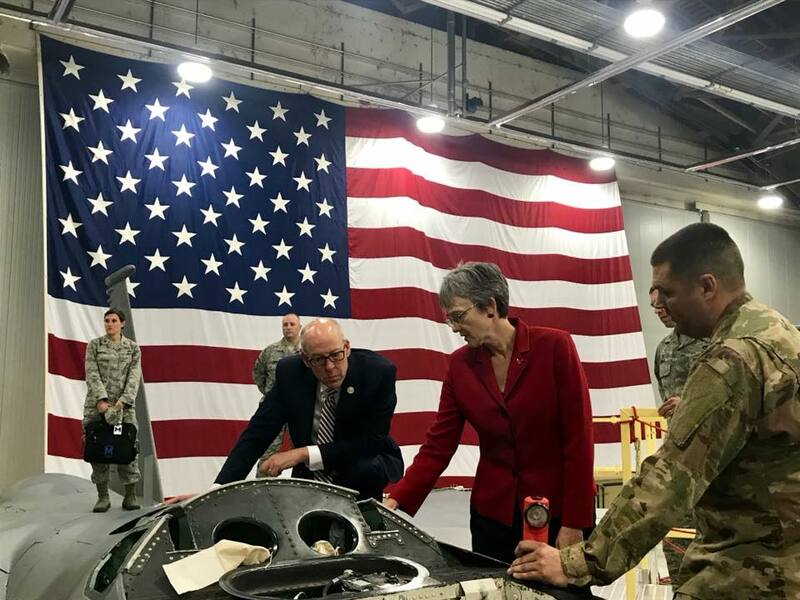 Rep. Greg Walden invited Heather Wilson, the 24th Secretary of the Air Force, to Kingsley to meet troops and commanders and scope it out as a potential site for a new fighter jet like the F-35. Click here to read more from the Herald & News. Secretary Wilson and I gather for a breakfast with local veterans in Klamath Falls. Secretary Wilson joined the breakfast fully suited in a custom “173rd Fighter Wing” fighter pilot suit, which she wore in preparation for her flight in one of Kingsley’s iconic F-15’s later that morning. Before Secretary Wilson departed Kingsley Field, we concluded her visit with a breakfast with local veterans in Klamath Falls. Secretary Wilson was part of the first graduating class at the U.S. Air Force Academy that began accepting women, and served our country in the Air Force following graduation. Secretary Wilson is a third generation pilot, and her grandfather flew for the Royal Flying Corps during World War I. 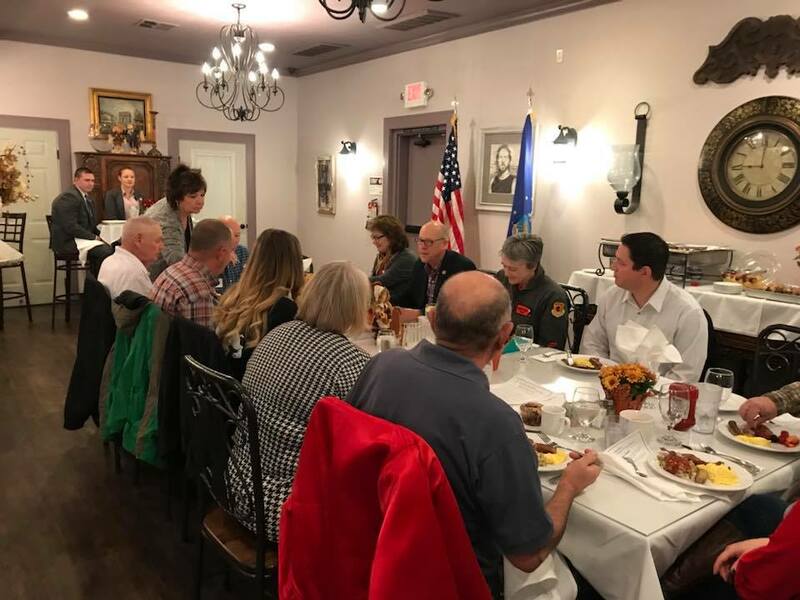 This breakfast was an excellent opportunity for Secretary Wilson and local veterans to share their experiences in the service, and to discuss the challenges facing those who have served our country in uniform. Secretary Wilson and I served together in the House of Representatives, and we worked together over several months with Colonel Jeff Smith and the Oregon Air National Guard to make this historic visit a success. I appreciate Secretary Wilson’s willingness to come here on the ground to see why Kingsley Field is such an integral part of our national security strategy and local community in Klamath Falls. And thank you to Colonel Smith and the troops stationed at Kingsley for your service to our country and your tremendous efforts to make Secretary Wilson’s visit to Klamath Falls one for the history books. Local veterans sat down with Air Force secretary Heather Wilson in Klamath Falls Sunday morning. 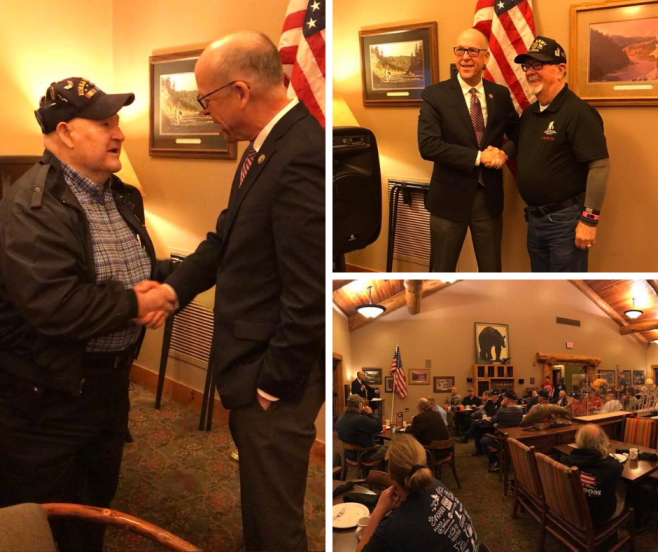 Hosted by Congressman Greg Walden (R-OR, 2nd District), a group of about 20 veterans gathered for an intimate breakfast discussion. “This community is really important to the support of the base and it’s great to have veteran leaders in the community,” Wilson said. Click here to read more from KTVL News 10. One of the greatest privileges I have as a member of Congress is meeting with the brave men and women who have served our country in uniform, like the veterans with Grants Pass Veteran’s Breakfast. The monthly Grants Pass Veteran’s Breakfast is a great opportunity for camaraderie and friendship for veterans in the area. Recently, I had the honor of joining the veterans at their breakfast to give an update on my efforts to make sure they are receiving the care and support they deserve at the VA.
With my strong support, Congress has passed into law historic funding for the VA to ensure the VA has the needed resources to give veterans access to the best care possible. We’ve also directed resources specifically aimed at serving veterans in rural areas and strengthening mental health and suicide prevention programs. In addition, we’ve also passed into law the VA Mission Act to bolster the VA, fully fund the VA Choice Program, and give veterans timelier access to quality care through my legislation — the VA Medical Scribe Pilot Act. Thank you to the veterans with Grants Pass Veterans Breakfast for inviting me to your monthly meeting, and for your service to our country. 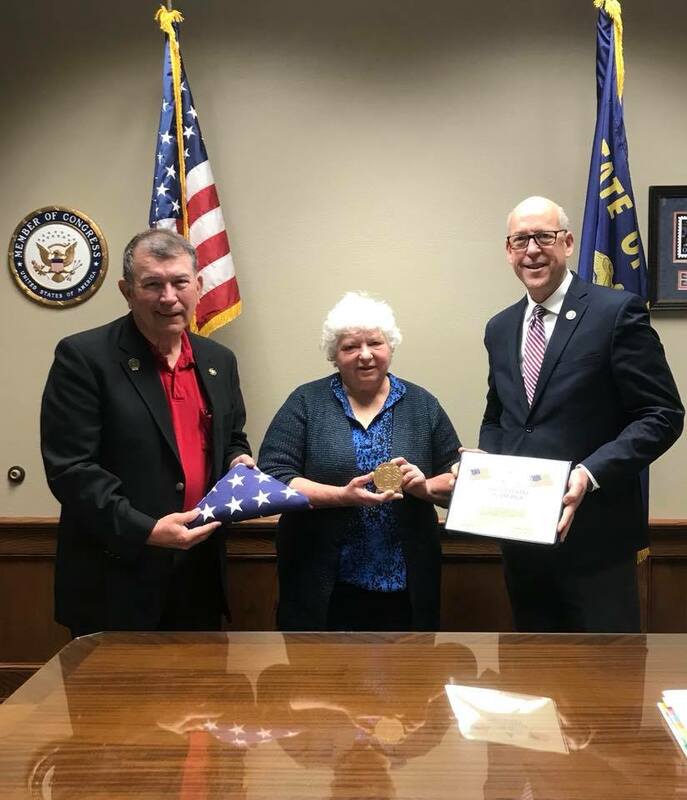 Earlier this month in Medford, State Representative Sal Esquivel and I had the honor to present Ashland resident Sherry Smilo the Congressional Gold Medal in in recognition of her father, SGT Sidney Smilo. SGT Sidney Smilo served our country during WWII as a member of the 801st/492nd Bombardment group (Carpet baggers), the air arm of the Office of Strategic Services (OSS), the predecessor of the modern Central Intelligence Agency (CIA). The men and women who comprised America’s first spy agency were awarded the Congressional Gold Medal, collectively, in recognition of their superior service and major contributions during WWII. These women and men — who performed some of the bravest acts of the war — had never before been collectively recognized for their heroic and pioneering service. It was a privilege to present Sherry with this much deserved recognition of her father’s service to our country, especially during Military Family Appreciation Month. America’s military is strong in part because of the family, friends, and loved ones who support those who serve our country in uniform. As we recognize Military Family Appreciation Month this November, please join me in thanking the families of our service members for their unwavering commitment to the brave Americans who defend our freedoms. Military families serve too, and we are forever in their debt. 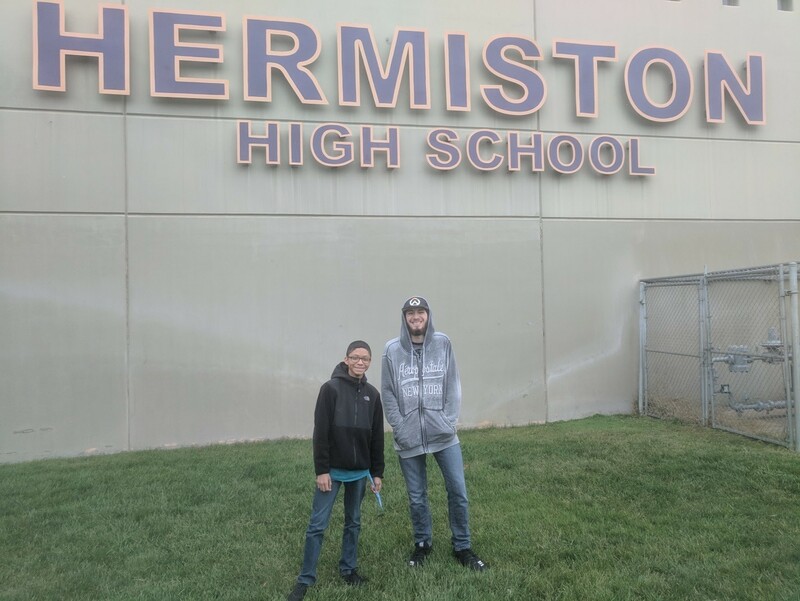 From left, Rogelio Lemus and Ethan Orozco, juniors at Hermiston High School in Pendleton, created the winning app for the 2018 Congressional App Challenge. Recently, I was proud to announce that Rogelio Lemus and Ethan Orozco, juniors at Hermiston High School, are the 2018 winners of the Congressional App Challenge for our district. The Congressional App Challenge is a competition to encourage students across the country to learn how to code by creating their own applications. The App Challenge highlights the value of computer science and STEM education (Science, Technology, Engineering and Math). Rogelio and Ethan created an app — called B.A.N.A.N.A — using facial recognition technology to help find missing people. The app allows people to upload a photo of a missing person to compare the photo against a national database. I applaud Rogelio and Ethan for their coding skills, their goal of helping people and their ability to communicate the usefulness of their app. Rogelio and Ethan chose a worthy project that has the potential to help local law enforcement. The Congressional App Challenge is an avenue for encouraging students to pursue careers in coding, math or science fields and I hope Rogelio and Ethan will do so. If you or someone you know is interested in learning more about the Congressional App Challenge, you can find more information on my website here. Two Hermiston students have created an app that may help locate missing people, and have been recognized by Congressman Greg Walden for their work. Click here to read more from the East Oregonian. That’s all for this update. Remember, you can always keep in touch with me via email, Facebook, Twitter, and Instagram. It is an honor to represent you in the U.S. Congress.